GAMBIT: Updates: Letting the World Be - The Inherent Politics of Stealth? Letting the World Be - The Inherent Politics of Stealth? This phrase appears if you pause Metal Gear Solid 4: Guns of the Patriots. It appears in English under a bit of Kanji, the same Kanji that appeared on ads before the game's release. It also appears in-game on Snake's suit. I'm not sure how diegetic it's supposed to be, if the implication is supposed to be that it's been consciously chosen by Snake and Co. or if its just so supposed to be a symbolic statement by Kojima, but it clearly is important in light of the game's narrative arc... or, more accurately, the series' narrative arc. "Let the world be" is a variation on what Big Boss (the supposed "villain" of the series) tells Snake at the MGS4's end, which sums up his (and assumedly Kojima's) entire world-view, the sum-total of everything he's learned over the course of his political and military career, which spanned most of the major conflicts the 20th century and involved as its principle enterprise the creation of a country in opposition to (among other things) the United States' military hegemony over the world. This phrase is, at the end of the day, probably the biggest problem I had with MGS4 (and I had many). I felt it was a disappointing cop-out to the provocative 20th century counter-mythology Kojima and his collaborators had developed over the course of 20 years, but which flowered primarily in the latest three installments (MGS2, MGS3, and MPO). I realize Kojima doesn't want to advocate war or revolution, but going so far as to have Big Boss--the series' fascinating ideological enigma--flat out say it's categorically bad to try to change the world was to me a betrayal of every interesting moral/political contradiction the series had previously (and boldly) reveled in. Not change the world? Let the world be? That's always the right political choice, huh? That's what you've got to say to Gandhi, Malcolm X, and anyone else who ever felt injustice demanded change? Maybe not "by an means necessary", but surely there is change worth fighting for, and surely the means are up to each one of us to either support or denounce based on what we personally consider necessary. Surely the lesson cannot be "fighting for anything is bad". Or am I misunderstanding the phrase "let the world be"? "Letting the world be" may be the absurd ideological resolution MGS4 attempts to force on otherwise rich material, but it interestingly mirrors the ideological resolution of another great stealth series, one that isn't nearly as absurd. 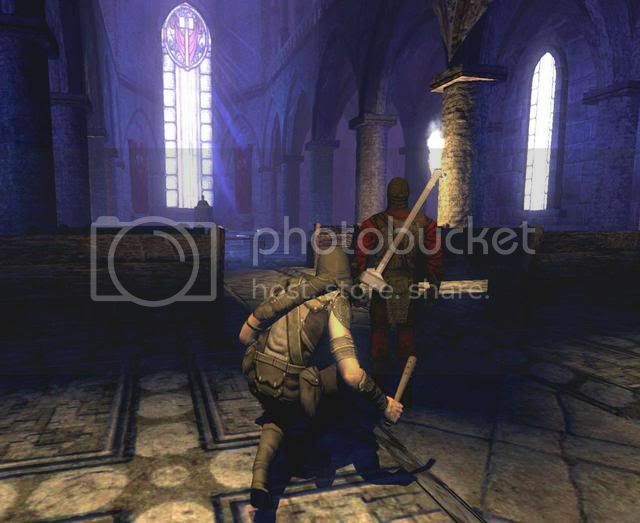 Thief III (or Thief: Deadly Shadows, as it was publically known), the final if little played installment of the (mostly) brilliant Thief trilogy, actually had a similar kind of thematic arc. The Thief series was about Garrett, the greatest thief in the world, rejecting the way of his mentors, the Keepers. The Keepers used stealth to observe the world and be its chroniclers, sort of like historians. But Garrett chose to use the skills they taught him to steal rather than learn. The Keepers have a philosophy of balance, which manifests politically as a strict policy of non-involvement, which is why they practice stealth. Thief III was about Garrett realizing how corrupt the Keepers had become, about how they really were meddling in political affairs, and how he activates an ancient fail-safe designed to wipe out their age old store of knowledge. Garrett does this not out of altruism or a conscious belief in their values (which he thought he had rejected) but out of a desire to keep the Keepers from messing with the delicate political balance he profits from by stealing. (Wars are bad for business.) In doing so he ironically was the one true Keeper left, because he wanted balance, and achieved it through stealth. The Metal Gear and Thief series both feature central villains whose original intentions to change the world for the better become hopelessly corrupted, which necessitates their destruction by a reluctant, stealthy (anti)hero. "Leaving the world as it is" (to uses Big Boss's phrasing) has an interesting resonance in both cases, especially when one realizes this concept is fundamental to the gameplay DNA of the stealth genre. In stealth games players must ask themselves at any given moment "do I interfere?". Sometimes intervention is best. Someones it is not. But it's not coincidental, I feel, that both these series are stealth-based, which means that "to let the world be or to not let the world be?" is a political question the player answers in microcosm every time they make a decision during play. Are stealth games fundamentally about the morality of covert versus overt intervention in any given circumstance? Is it worth killing someone to steal something? What about to save the world? Am I just the ultimate non-interventionist if I play Thief or Metal Gear without touching or altering anyone? Have I agreed to "let the world be"? Funny that I find doing "pacifism runs" of stealth games so satisfying, such an exquisite test of my obsessive-compulsive moral conscience, but still I find the ideological conclusion at the end of MGS4 so infuriating. Maybe it's because MGS4's story is stupid in about 20 other ways, or maybe it's because I feel the real world geopolitical problems Kojima mythologized demand a less bone-headedly sentimental resolution. 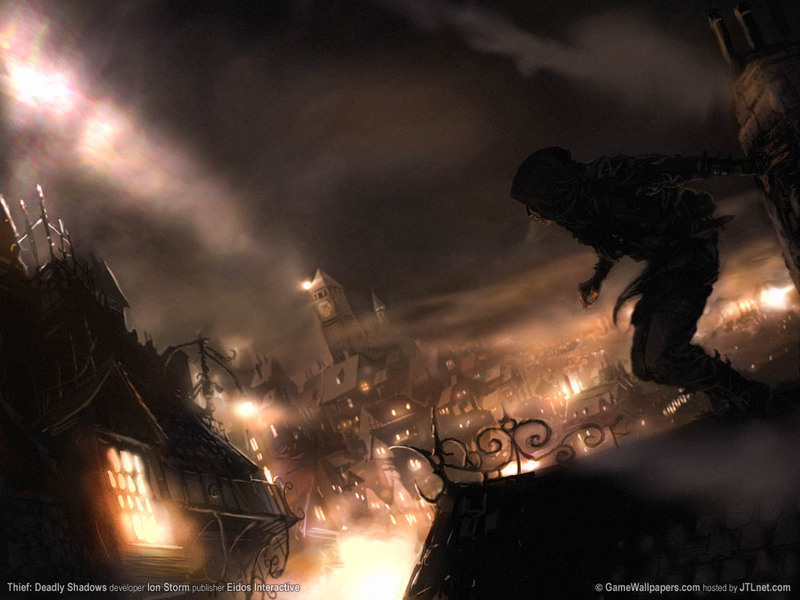 Thief took place in a steampunk-ish medieval fantasy world, but it still managed to generate a resolution that was subtle and complex, not silly and reductionist. If Big Boss's final lesson had to be that "stealth" is the best political strategy for a war-torn world filled with suffering, that could have been an interesting notion had it been treated as the beginning of a conversation rather than the end of one, as a question rather than (absurdly) an answer. Part of me thinks Kojima was just so intent on ending the series in MGS4--in tying up all its loose ends, even its thematic ones--that he reached for easy solutions more out of desperation than any genuine ideological agenda. Big Boss's weird apoliticism at the end of MGS4 seems to have been thrown totally out the window, for example, in Peace Walker, which is about Big Boss defending a seemingly defenseless country (Costa Rica circa 1974) from covert U.S. military occupation. Of course, one might assume this just represents a step on his road to regret (he doesn't see the "error" of his ways, according to MGS4, until 2014), but on the other hand it's really hard to imagine Kojima suggesting that letting a super power walk all over a smaller country is the "right" thing to do. Indeed, all advertising for the game seems to suggest precisely the opposite. The stealth genre may be the ideal one for posing political questions surrounding use of force to the player, precisely because it is the only game genre where violence is always a question. Is violence necessary? Do I really need to kill this person? What if I sneak past him? What if he tries to kill me? Then do I kill him, or do I run away and sneak by him later? I know there's a way to do this without killing anyone, but I also know it's the hardest possible way to do things. Every time I take the easier way out, or try to rationalize my mistakes, and the resulting bloodbath, as inevitable (and therefore justified), have I done what politicians, generals, and soldiers do when they make the decisions we pay them in order to not make ourselves? It's a question worth asking, and one that the player (not the developer) should be answering.